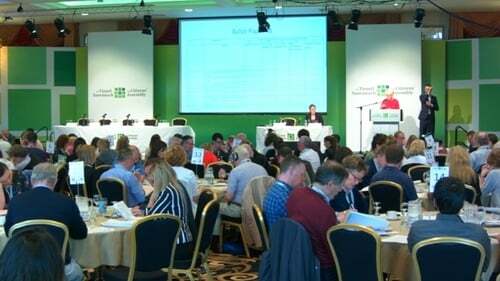 The Citizens' Assembly has voted to recommend an extensive liberalisation of the grounds on which abortion is available in Ireland. In all, the Assembly approved 13 grounds for legal terminations in the event of the electorate supporting its recommendation that the current Constitutional restrictions on abortion should be replaced in a referendum. The Assembly voted to recommend that terminations of pregnancy should be available in Ireland with "no restriction as to reasons" by a margin of 64% to 36%. Of the members who backed that proposal, almost half said abortion 'on demand' should only be available up to 12 weeks' gestation while marginally fewer said 22 weeks' gestation should be the cut-off point. Among the other far-reaching reforms that were supported this afternoon was the possibility of providing abortion when there is a risk to the health of the woman. Another was when the unborn child has a significant foetal abnormality that is not likely to result in death before or shortly after birth. Eighty-eight of the Assembly's ordinary members finalised the proposals in a secret ballot following an intensive process which included ten days of seminars and meetings over the past five months. The Assembly's Chair, Ms Justice Mary Laffoy, is to deliver the body's report on the Eighth Amendment to the Constitution to a Joint Oireachtas Committee within the next ten weeks. Then within three months of convening, that Committee is required by law to inform the Dáil and Seanad of its verdict on the Assembly's recommendations. The eight-question paper was earlier enlarged to include the possibility of providing abortion for socio-economic reasons and to distinguish between a "risk" to the life of the mother and a "serious risk to her life". If the Dáil and Seanad accept the consultative body's advice, a constitutional referendum would be needed to bring in the reform. At yesterday's deliberations, the Assembly voted secretly three times. Firstly, by almost seven to one they rejected the current constitutional restrictions; a move Assembly Chair Ms Justice Mary Laffoy said would necessitate a referendum if legislators adopt the recommendation. Then, by a 12% margin, they rejected the option of repealing the Constitutional article containing the highly contentious Eighth Amendment, opting instead to replace or amend it. Finally, by a 14% margin, they voted that the current constitutional restrictions should be replaced with a provision in the basic law that would explicitly authorise the Dáil and Seanad to legislate on the issue.